We review the best color laser all-in-one multi-function (print, copy, scan and fax) which also has wireless (Ethernet and NFC) capability – the HP LaserJet Pro M477fnw. This is designed for small work groups / businesses and is great for a home office and personal use. The value comes in the relatively low price (about $350) for the laser printer, and the low cost per page thanks to high capacity ink toner cartridges. We’ve found that the HP M477fnw is also a favorite at many co-working spaces in our area. The feedback from users across many industries is that this printer holds up well over time, is fast for printing and scanning, and the wireless connections (both Ethernet and Near Field Communications) are simple to use. The HP LaserJet Pro M477fnw Multifunction Wireless Color Laser Printer with Built-in Ethernet (CF377A) is readily available at most big-box stores and of course through Amazon (you can order with the link above, or the image below). This is a Laser Printer, rather than an Inkjet. In general, the two technologies can be summarized as: Laser printers use a toner cartridge (filled with fine powder) and a heated element to put ink on the paper. Inkjet printers use liquid ink sprayed through microscopic nozzles directly onto the paper. Both accomplish the same thing, but have different resolutions, speeds and other capabilities. 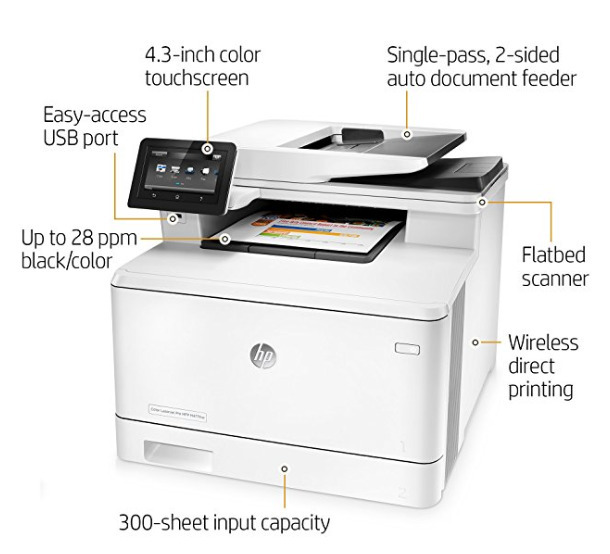 As an “all-in-one” or “multi-function”, the HP M477fnw will print, copy, scan and fax. With the included software you can also email documents from a scan as well as email a document to the printer to print. What we like about the M477fnw are the options to get your files into the printer. The most common is with wireless Ethernet. This LaserJet supports a 1GB/s connection, which is excellent for large files (especially those with a lot of graphics). The other wireless connection for printing is Near Field Communication (NCF) touch-to-print. With the NFC option, which is also available on most smartphones, you only have to place your phone next to the printer and you’ll have a connection to print. There is an app from HP which you can use to control and monitor your print jobs. This works on iOS, Android and Windows smartphones. You can also print from your computer after setting up the printer as an option. Unlike many other printers, the M477fwn has 2 USB ports, both USB 2.0 compliant. The first is for “Walk-Up” printing and scanning without a computer. If you have a file or photo to print, you can put it on the USB drive and insert the drive into the printer. The control panel on the printer allows you to select what you want to print, and control any options you want to apply. The second USB port is for job storage information. You can have a portable record of everything that happens on the printer. This very useful for offices that need to account for billing, or need to ensure time receipts for faxes. You can also protect sensitive information and improve compliance with data, device and document security solutions using the USB port or with administrator software tools (included). This is a speedy printer, able to print out up to 28 pages per minute (ppm). First page out in as fast as 8.9 seconds for black, and 9.8 seconds for color. The printer comes with a 50-sheet auto document feeder for copying and scanning. The paper tray holds 300 sheets, and the output tray holds 150 sheets. One missing feature is for automatic 2-sided (e.g., duplex) printing. On the M477fwn model, if you want to print on the opposite page side, you’ll need to manually flip and re-insert the pages. The next model up, the LaserJet Pro M477fdw (CF379A) has this capability, for about $70 to $100 more. You can scan through either the document feeder or directly on the glass. Scans are processed at up to 26 pages per minute (ppm). The touchscreen is a high resolution, 4.3-inch color screen. We like that it has a tilt capability for easier viewing. Most other printers have the screen fixed into the printer, which is sometimes at an awkward angle or has too much glare from overhead lights. This is a nice bonus. Overall, this is a great printer for everyone from a personal home user to a small workgroup. You can expect to easily print 4,000 to 5,000 pages a month with no issues. The LaserJet Pro M477fnw is a solid, reliable printer at a very good cost. The only issue we found was the lack of automatic 2-sided printing. The one complaint about the LaserJet Pro M477fnw (CF377A) is that it does NOT have automatic duplex (“2-sided”) printing built-in. To print on the second side, you’ll need to take the pages out, flip them over and then print on the second side. Not everyone needs or wants to have automatic 2-sided printing. If auto duplex 2-sided printing is a feature you’ll want / need, then it’s highly recommended to get the LaserJet Pro M477fdw (CF379A). It’ll cost about $70 to $100 more, but it’s worth the price if you want this added feature. You’ll get all the same features as the LaserJet Pro M477fnw (CF377A), and it has the same print speeds, scan speeds and wireless capabilities. HP just added in the internal mechanics for the 2-sided printing, and charged for it. Lastly, don’t forget the laser ink toner cartridges. The printers ship with the small capacity ones, usually good for about 50 pages for each of the 4 cartridges (Black, Cyan, Yellow and Magenta). It’s enough to get started, but you’ll be surprised how quickly you can run through these. There is a chip in each cartridge so that HP can recognize it as original equipment. You can purchase 3-rd party cartridges, usually at lower price, and the printer will use them while giving you a warning. However, we recommend paying for the HP quality cartridges which also maintain your warranty. Yes, using non-HP products will void your warranty since many of these do have a tendency to gum up the printer. We did a separate test with both laser and inkjet printers, and it was always just a matter of time until a 3-rd party cartridge caused problems. It’s just not worth it (!). The M477 series takes the “HP 410” laser ink cartridges in Black, Cyan, Yellow and Magenta. These are available individually in “Standard Capacity” (A) and “High Yield Capacity” (X). You can also buy them as a bundle package with all three colors. To get an idea of how many pages you can expect from a cartridge, we checked the official HP site : LaserJet Page Yields . There is a lot of discussion about whether the High Capacity is a better value than Standard Capacity. In our dealings with HP printers and Ink, it’s usually best to buy the High Capacity since these do provide a lower cost per page. In general, the Black Standard Capacity is good for about 2,300 pages and the High Yield is good for about 6,500 pages. For the color cartridges, expect about 2,300 for the Standard and 5,000 for the High Yield. Inkjet versus Laser – Laser printers are best for higher volume printing and if you are mostly printing text. For photos and full-range, high resolution color printing you’re better choosing an Inkjet. Laser is generally faster than Inkjet. Automatic 2-Side Printing – As mentioned above, not all printers have an automatic feature to flip the paper over internally to print on the other side. Consider how often you print 2-sided documents, and then decide if the extra (about $70) cost is worth it for auto duplex printing. Cost Per Page – The true cost for printing really comes down to the price for the ink and the paper. Laser printers tend to have the lowest price per page when considering the ink cost. Workload – The printer recommended here is great for a home, small office or small business. If you have more than 5 to 10 people that are needing to print, or some that print a lot, you’ll want to consider a higher end workforce unit. It’s frustrating to have to wait while someone else’s pages print!